You’ve just clicked “Send” on an email you’ve carefully prepared. The mail client notifies you that it was successfully sent. You then notice something – multiple spelling errors, an attachment you forgot to add, you’ve sent it to the wrong person. If only there was a way to unsend that mail and save yourself the embarrassment! Well, I’ve got news for you – you can! In this article, we’ll show you how to unsend emails on Mailbird, Gmail and Outlook! Mailbird enables you to unsend an email from all email accounts – even those that originally do not have an unsend feature! How Mailbird Eliminates Common Mistakes so that Unsending becomes unnecessary. Mailbird is a desktop email client that can make managing emails from all your accounts a breeze. With it, you no longer have to log on to a browser to check your mail each time. You can do it right from the comfort of your desktop itself! Mailbird also makes it super easy to unsend email and save yourself from an embarrassing social faux pas. 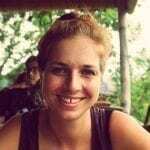 Why Use Mailbird to Unsend Email? As Mailbird supports almost all POP and IMAP accounts, you can use this feature with your Gmail, Yahoo, Outlook or any other email account. This is incredibly helpful as Mailbird allows you to unsend an email from an email account that originally might not support the unsend feature! Additionally, Mailbird can offer you tons of other features to safeguard you against having to use the unsend feature in the first place! Go to “Settings” in the menu bar in Mailbird and click on the “Composing” tab. Once there, scroll down to the “Sending” section. You can drag the slider to choose how much time you’ll want to have to unsend any email. By doing this, you can give yourself upto 30 seconds of leeway when you send an email next time! You won’t need to worry about clicking any other buttons to save the changes. Once the slider is set to anything greater than 0 seconds, the undo feature is activated automatically when you’re sending a message. You’ve now set up the “Undo send” feature on Mailbird. So let’s get down to putting it to good use when sending emails. Whenever you send an email message now, you’ll see a “sending” message at the bottom of your screen. This will be accompanied by an unsend button – ‘Undo’ -to quickly stop the email. If you click the unsend button, you will recall an email that was just about to be sent. It’ll then show up in a separate composer window or your in email list – depending on how you composed it. It’ll also go to your Drafts folder where you can access it if you want. You can then easily make the changes to the email address and other details in your email. Gmail has the ability to recall an email. You just have to activate it. Click on the Gear icon in the menu bar at the top right of your screen. Once you click the Gear icon, it’ll give you a drop-down menu where you can then click on the Settings icon. 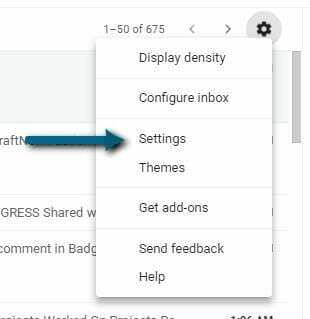 After clicking the Gear button and the Settings icon, you’ll be presented with a few different tabs – “General”,”Labels”, “Inbox” and so on. The one that matters here is the General tab. It’s the tab that opens by default for most people. Scroll down in the General tab until you see the “Undo Send” section. When you’ve found it, click on it. 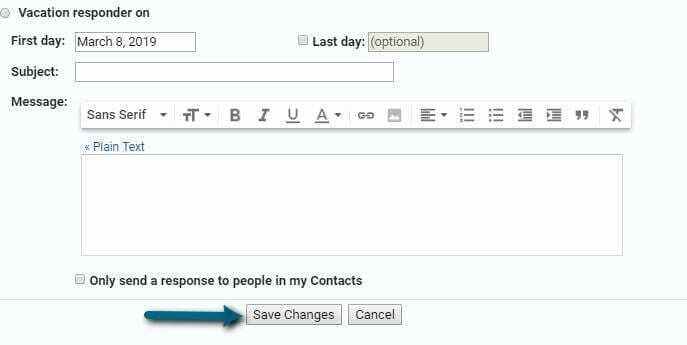 It’ll give you a drop-down menu that allows you to choose the number of seconds Gmail will pause before sending an email. You have a choice of a 5-30 second time frame here. I’d recommend 30 but that’s because I like to play it super safe with my time frame when sending an email. I made this mistake before andnd have regretted it ever since. I did all of this, but then forgot to scroll down and click on “Save Changes” at the bottom of the screen. You’ve now set up the undo send feature. So how do you go about it when you’ve sent a mail to the wrong person or sent one riddled with spelling errors? Remember that terrifying notification you get after hitting the send button – “Your message has been sent”? That’s going to be your saving grace when sending emails that need to be unsent. Once you’ve enabled undo send, that message will be accompanied with an Undo button next to it under your search menu bar or at the bottom of your screen. Once you click the Undo button, you’ll receive a notification that says “Sending undone”. Congratulations! Your email message didn’t go out. You can now make the necessary edits and send it out again later. But what if you click Undo button but don’t receive the “Sending undone” notification? It’s because you probably didn’t click the Undo button fast enough when sending a message and it’s already gone out. You can always double check this by going to your “Sent” folder to see if the email is there. If it is, then you’d better get down to writing a follow-up email message straight away. You’ll receive the same “Sending has been undone” notification after you’ve clicked the keyboard shortcut when sending a message. A lot of people prefer this because you don’t have to look at your screen and find the “Undo” button when sending emails. That can waste a lot of time, and when you’re time frame to unsend a mail is just five seconds – every second counts (unless your data transfer speeds are really low – then you have some bonus seconds to play with!). What if your not using the desktop version of Gmail? What if you sent an email you wish you hadn’t on your mobile mail app? Don’t worry, Apple and Android users, we’ve got you covered. If you’ve set up undo send earlier, you’ll be fine. Once you send an email on the Apple or Android mail app, the “Undo” icon will pop up at the bottom of your mobile app. Click it and there’ll be an “Undoing” message displayed at the bottom of the Apple or Android mail app. After this, you can make the necessary changes before you resend the email from your mobile app. 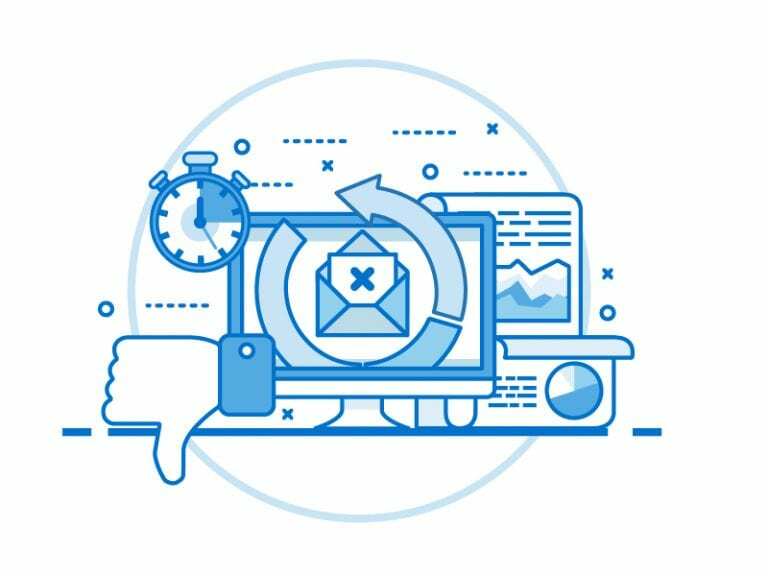 Before we start off with showing you how to unsend emails with Outlook – you need to know that this only works if you have a Microsoft Exchange account. So if you’re a standard Outlook user, then there isn’t much you can do. The standard version doesn’t have the ability to recall a message. 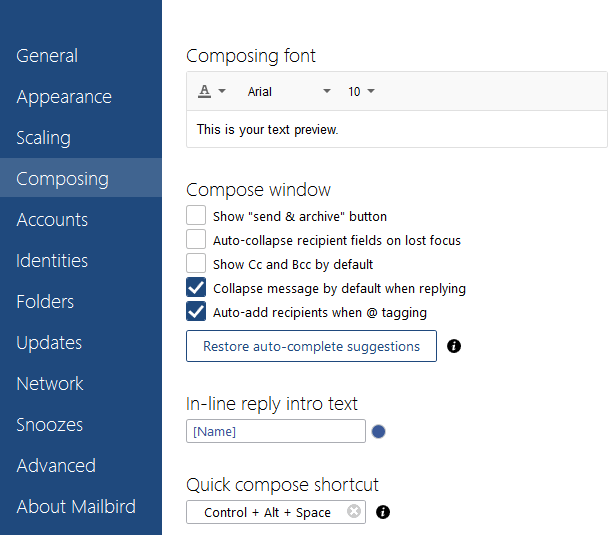 When you need to recall a message, go to the “Sent Items” tab in Outlook and click on the mail that needs to be unsent. Once you’ve clicked on the mail, go to the “Message” tab in the window. Users must then click on the “Actions” button and then on the “Recall this message” button that pops up. 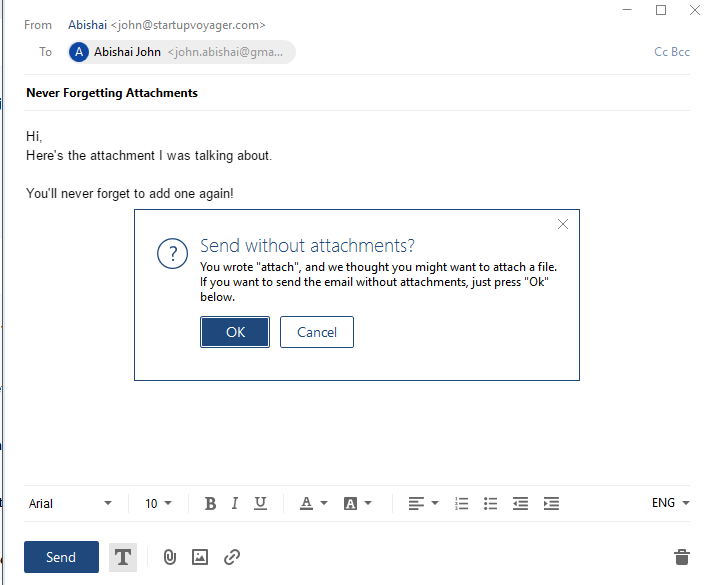 Users will now be met with a window that asks them whether you want to just recall email or resend the email. If you opt for the first option, then that’s it! If you want to replace the mail directly though, you’ll be shown a new composer window. Write in your new message and you can resend the email to the recipient. You could include the word “URGENT” in the subject as or something of the sort. This way, they’ll open the second mail first. If you’ve sent a mail but then tried to replace it with a new one, that first one doesn’t disappear automatically – it’s still in the Exchange server. 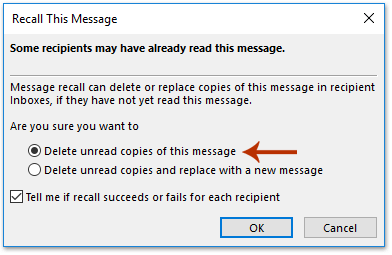 As such, you can’t immediately recall a message as it’s still in the recipient’s inbox. The only way it gets deleted from the Microsoft Exchange server is if they open your replacement email first. There’s always a chance that they have opened your first mail already. Not much. You’d have to apologize and send a new mail with the right details. Not a great look for you right? Why recall email when you can just not send it? With Mailbird, you won’t have to worry about retrieving an email that went out. Mailbird’s undo send feature is more like a delayed send option. This way, the software waits for the specified time period before sending your mail out. If nothings gone out in the first place, there’s no worry about getting it back right? It isn’t caught midway in some Microsoft Exchange server or lingering in someone’s Gmail inbox – nobody’s getting it. It goes straight to your Drafts folder where you can make all the changes you need to. The Outlook mail client won’t allow you to unsend email if the recipient isn’t on the same server. Say you have an Outlook account. You just emailed someone with a Gmail account. You change your mind and want to delete it as it was a mistake. Even if you have all the plans in place, the email service won’t allow you to recall an email as there’s a Gmail email address involved.  Mailbird supports both POP and IMAP accounts. It means it can handle almost any webmail client you’re currently using. Gmail, Yahoo, Outlook – anything! Because of that, it doesn’t discriminate between accounts. 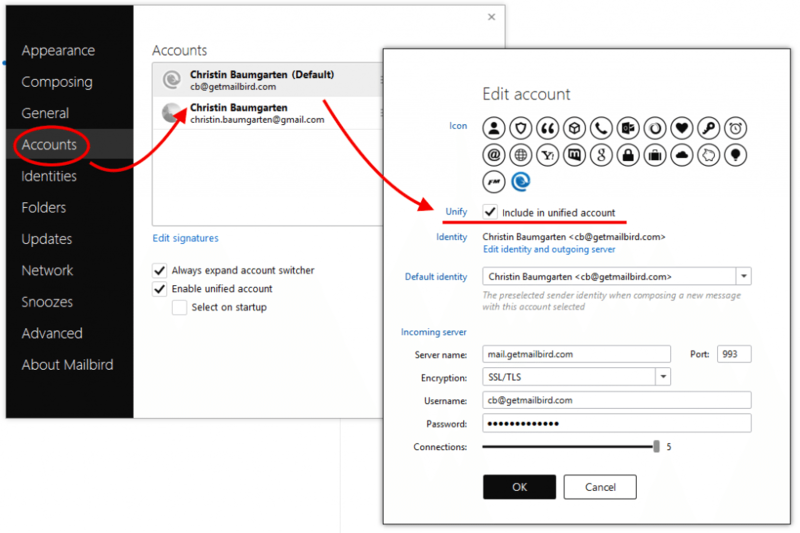 Using your Gmail account but want to delete something sent to a Hotmail account? Mailbird can handle that for you easily. It’s clear to see that having the ability to recall a message can be extremely helpful. But remember, an unsend feature should always be your last resort. Ideally, you shouldn’t have to even use it. If you can tackle why you’re having to unsend emails, you will rarely need that feature. In this section, we’ll go over a few reasons and how Mailbird can help you with them. This way, you’ll always have the unsend feature – you just won’t have to use it. I’ll be the first one to admit it. Attachments can be a pain. I can’t remember the number of times I’ve forgotten to add an attachment to a mail. A simple mistake – but results in so much embarrassment! But how can your email client software avoid a forgotten attachment? Mailbird can detect whether a mail should have an attachment by analyzing your text. 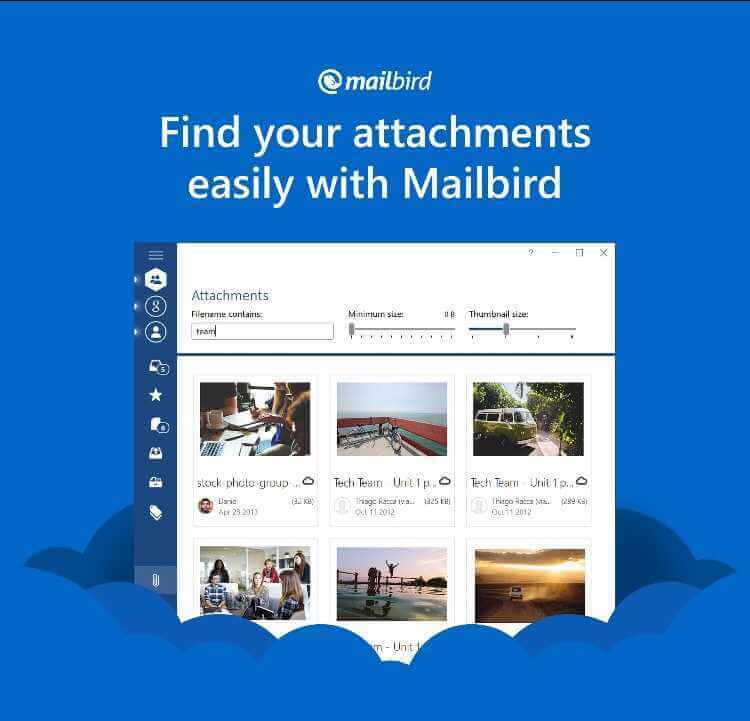 With Mailbird, you’ll never forget to add an attachment again! You’ve gone through a mail but overlooked a question they asked you. You’ll then have to go through a follow up where they ask you the same question and you feel foolish for not noticing it the first time around. This isn’t a great look for you. But I can’t blame you. We receive over 100 emails a day! You’re bound to overlook something. But what if answering questions was far easier? You wouldn’t have to worry about unsending an email to address something you overlooked. 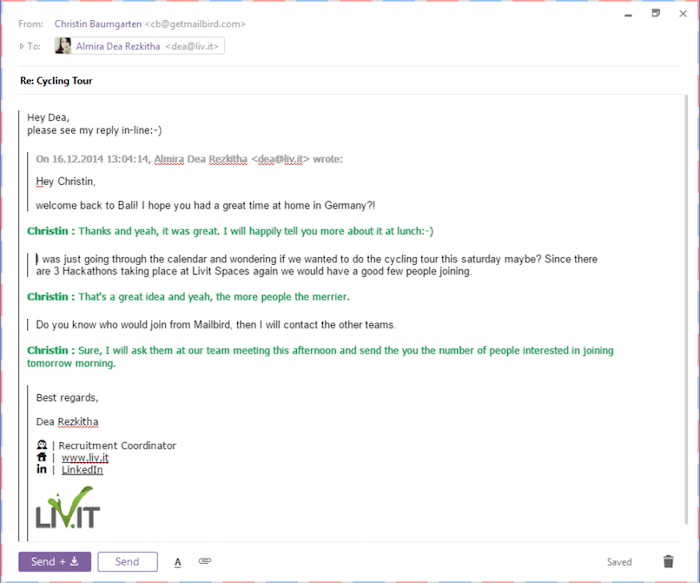 Mailbird gives you an “in-line reply” feature. What this does is allow you to respond to a question or statement in a mail right under it. Because you’re responding to it immediately and right below the question, the chances of you forgetting to address it are next to nil! You know what else is next to nil? The need to unsend an email! You’re back from vacation to find your inbox filled with unread emails. Trying to respond to all those emails is going to be a mammoth task.It’s enough to make you want another vacation immediately! But if you don’t respond to these, they’ll just clog up your inbox and it’ll be difficult to respond to any new emails too. So you rush through them – trying to address each one as fast as you can. How do you deal with this never ending cycle of emails? 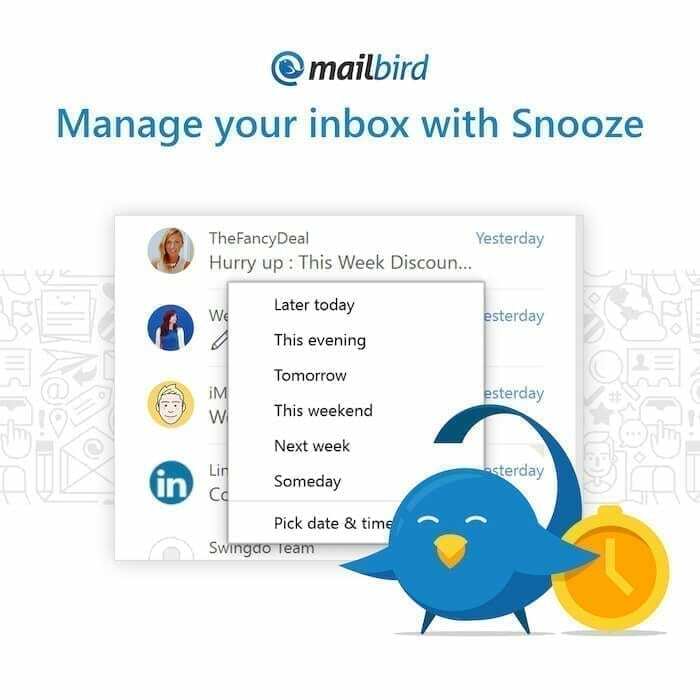 Luckily for you, Mailbird has a Snooze feature. With it, Mailbird can send all these unread emails to a designated snooze folder for the time being. Here’s how the feature works. You can set a date when you want to respond to those emails – a few hours, days or more. Once an email has been snoozed, it will disappear from your inbox. During that time, they will be neatly tucked away in their own ‘Snooze’ folder, your inbox won’t be full and you can address any new emails that come in easily. People have multiple email accounts for several reasons. Maybe one is a work email and the other is a personal one. You might have three different personal emails. With regular webmail accounts, it’s pretty hard to keep track of all email accounts. You’ll have to log into each account separately and check for updates from time to time. Chances are, you’ll overlook some emails or reply to them super late. 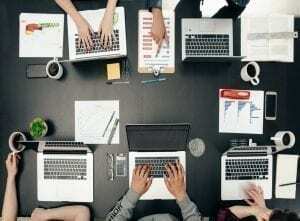 Is there a way to get all your emails, from all your accounts in one unified space? With a secure email client like Mailbird, you get a unified inbox for all your accounts. You won’t need to remember multiple passwords or juggle different email accounts ever again! 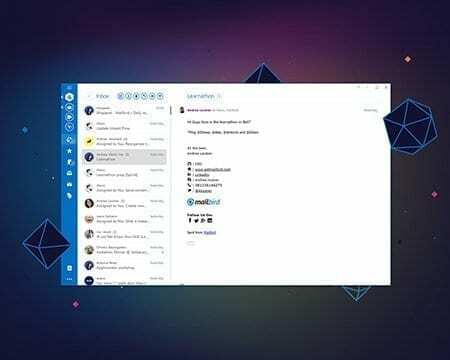 All your mail – from your Outlook account, your Gmail account, your Yahoo account – your secure messages will be presented to you in one common space. This makes it super easy to keep track of everything and not lose out on anything important. Worried about losing track of which emails were sent to which account? You can color code each account to make sure you’ll easily identify the accounts that emails were sent to! Think of modern webmail clients as off-the-rack suits. They’re great and still get the job done, but it isn’t tailored to your needs. You’ll have to adapt to what it offers you. This can be an issue when you spend a lot of time in your inbox. If you’re going to be spending hours there, it might as well be a place that’s suited to your preferences right? Mailbird is like that custom tailored suit you see stars wear on the red carpet. It’s made as per their specifications only. The only difference here is that Mailbird doesn’t cost that much! You have complete customizability regarding themes and layouts. Want a light theme or dark theme? No problem! Want to have your own Star Trek theme? Sure, why not? You can also easily shift to a 3 column, small screen or preview layout in seconds to suit your preferences! Remember, this is your email service – it should adapt to your preferences – not the other way round. Why spend hours manually looking for that photo from social media that you emailed years ago, when you could just let the software do it for you? With Mailbird, you just add in the partial file name of your attachment and it’ll find it for you in seconds. The only thing stopping you from finding it in seconds now is a really slow internet connection! We wanted to make Mailbird one of the most secure email clients out there. There’s a growing need for email clients to offer you more than just secure messages. That’s why our email service has security settings in place. 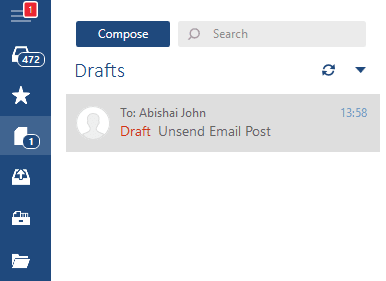 One of our features aimed at secure email is our attachment preview feature. The feature works as a partial safeguard against unknowingly opening potentially harmful attachments which might compromise your security. With it, you can preview an attachment or file (that are previewable) instead of opening or running it.This partially protects you from running a potentially harmful file. An example of this are files from tech support scams which are becoming increasingly common these days. Having said that, we would like to remind you to be always cautious about opening attachments from unknown senders as only as Mailbird is not does not include an antivirus feature. Having an unsend button for your emails is an absolute necessity. It can save yourself the trouble of an embarrassing social faux pas! I can testify to that first hand! But with a client like Mailbird, you won’t even have to use that feature. You’ll be breezing through your emails with finesse and rarely make such mistakes. 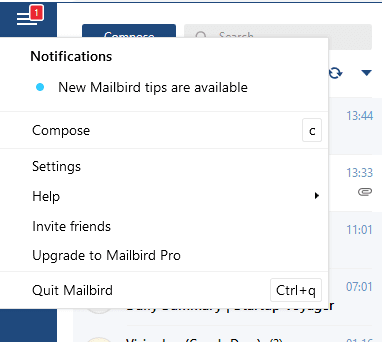 Why not try out Mailbird for free today and experience it yourself! Editor’s Note: This post was originally published in February 2016 has been revamped and updated for accuracy and comprehensiveness. 33 thoughts on "The Best Way To Unsend Email in Gmail, Outlook and Yahoo (2019 Update)"
Having done undo send, What I need the most is a way to track opens and clicks. I do this with getsidekick.com in Google Apps. Does this work with personal IMAP email accounts on your own domain name (so not a gmail, yahoomail, windows live mail account but a personal email account such as [email protected])? Yes it does because the client simply doesn’t contact the mail server until the timer ends. Regret for only delaying email, not undoing. Even this delay all email sending i want fast it. I’m a developer and Mailbird is certainly correct. This is the best stop gap that we can ask for. Please change “undo send” to “delay send” not to confuse all users of mailbird. Naming this feature “undo send” makes it sound bigger that it really is. Its delayed send. I like it. I like it a lot. Its very useful. My suggestion would be to rename it to “delayed send” so it more accurately describes what it actually does, and allow a longer duration. I would like to be able to set the delay up to 2 minutes. Other people might want an even longer delay. I do not mind seeing it as “undo” as long as I understand what it’s doing but yeah, 30 seconds is not enough.. at least 5min.. Another cool feature I have in my Thunderbird is “send later” so I can prepare emails at evening/night but send them when working day started and so on. Useful. We didn’t name it “undo send” to make it sound bigger than it is, but simply to align it with something that people already understand – Gmail’s undo send feature (which just delays the email sending just like we do – albeit in the background so you don’t notice it). We thought about having it show as having been sent as well, but that could lead to someone closing Mailbird thinking it’s sent, when in fact it has not. Gmail if you close the browser will still send the email because it’s already on the server, but we can’t do that as easily as a client on your machine. Something to note about the maximum duration is the message will currently send if and when another notification takes its place, so the only way to get the full 2 minutes would be to not perform stuff like archiving and deleting while you’re seeing that undo send notification. For that reason it’s not currently feasible to lengthen the time, without making other changes – but we’ll take it into consideration. I was not aware that Gmail had a delay send feature, or that they call it “undo send”. Apparently I’m one of the few people that absolutely despise Gmail’s web interface, I don’t use it. If that is what Google calls it, then perhaps it is already obvious to most uses what it does and how its expected to work. Yes, it’s already obvious to a lot of we gmail and google apps users. It’s called undo send. Nice introduction and a much needed one. Good feature. To people who want to rename it to “delay send”, that will just confuse people. Sure it is actually delaying the send, but the button people will click to recall the email will be “undo send”, so it makes perfect sense to call it that. This feature gives you time for 30 seconds to decide… What about if you realize the mistake after a couple of minutes? Is there any way to unsend? Better than UnSend would be if they fix the glitch where when you use the TAB key in an email, it goes to the SEND button (instead of tabbing 3-5 spaces) and if you then hit ENTER (because you tabbed like you would in a normal doc and are going to next line) it sends a half-finished email. Would like a longer delay – up to five minutes. 30 seconds is not enough time in my opinion. I do the same thing with my corporate email using an Outlook rule. But let me say – great feature! Are you working on this future updates? Hey Guilherme, thanks for your awesome support. 1. We will work on that at some point in the future.. but we are not near of being able to give details on that. That will still take some time.